Oconee County Chamber of Commerce - Join us for the Grand Opening of Hartwell Village! Join us for the Grand Opening of Hartwell Village! Please join us at the grand opening of Phase I of Hartwell Village on Friday August 24th from 3-7pm. We'll have a ribbon cutting, followed by a fun celebration with bounce houses, music, food trucks, and giveaways! Hartwell Village is an exciting new multi-use development located at Tiger Boulevard and Pendleton Road in Seneca, South Carolina. 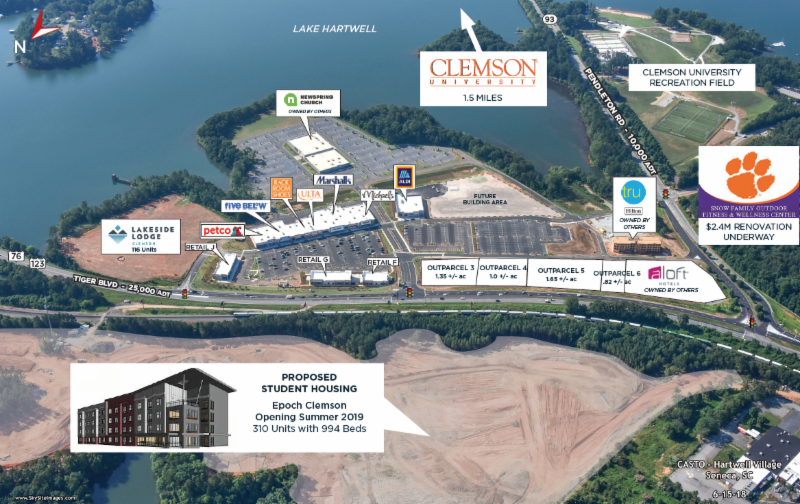 Featuring a mix of national and local retailers, restaurants, and hotels, Hartwell Village serves an expansive market area, including vacation areas of Lake Hartwell and Lake Keowee, the student, faculty and staff population of nearby Clemson University, and local communities of Anderson and Easley. Current tenants include Marshalls, Ulta, Rack Room Shoes, Aldi, Michaels, Five Below, Petco, and Five Guys. For more information, visit www.castoinfo.com. For more details on the grand opening event and Hartwell Village updates, like us on Facebook!